Inevitably, the choices made by a cable designer, conductor type, dielectric, spacing, geometry and shielding, and how these are balanced, determine the electrical properties and thus the cable’s sound. Stage III Concepts has been designing and meticulously hand crafting audio cables since 1996. My initial experience with their cabling was the purchase of one of their “Heighliner” power cords about ten years ago. At the time it represented the top of their AC product line. Its massive conductor array and extremely low resistance made it a natural partner for high powered transistor amplifiers, while its ability to lower the noise floor and deal with EMI and RFI made it an excellent choice for source components. During the intervening period, Stage III further refined their technology. The result of that effort was first the A.S.P. Reference Zyklop power cable and more recently the A.S.P. Reference Minotaur power cable. The Minotaur was designed at the request of customers who wanted the excellent sound of the Zyklop in a more compact, flexible cable at a lower price. Both power cables utilize flat, solid core, pure silver wire whose edges have been carefully tapered to reduce the portion of the wire that comes in contact with the insulating tube in which the ribbons are mounted. The conductors are made exclusively for Stage III using an ultra-slow, temperature-controlled wire extrusion process that minimizes crystal grain boundaries and stresses within the metal. After extrusion, they are subjected to controlled cryogenic treatment, where a temperature of -300 F is maintained for 48 hours. All other connectors and terminations undergo the same cryogenic tempering process. While the Minotaur employs six palladium/silver alloy AeroStrand Ultra™ conductors (2.5mm x 0.55mm) for each polarity in a tubular helix geometry which utilizes an air dielectric with FEP Teflon air-tubes, the Zyklop employs eight. The massive conductor arrays allow these unique cables to have extremely low resistance. The plus/minus twisted pair geometry is very effective in reducing induced noise and lowers both capacitance and strand interaction. The cables are shielded from outside interference with a proprietary foil plus silver plated copper braid, with individually protected ground, positive and negative conductors. The construction is multi-layer with a silica/ceramic/ferrite mechanical damping/shielding layer. The shield is never used as a signal conductor. All Stage III power cords, except the entry level Vortex, are now terminated with Exclusive Hyperion Ceramic plugs with silver/copper alloy electrical contacts, palladium plated and cryo-treated, with Custom handmade polymer-filled, carbon fiber plug housings (custom made by Stage III Concepts). Prior to these new ceramic plugs, the company had used the best available from other major manufactures. According to the company, in a direct comparison, substitution of the new Hyperion ceramic plugs resulted in about a thirty percent improvement in the sound of the cable. A Minotaur with the new ceramic plugs actually outperformed the more expensive Zyklop with the older industry standard plugs. The Minotaur was subjected to a fairly lengthy break-in on a cable cooker prior to any listening tests; thereafter, it was installed in my reference system at various points in place of the power cords which I normally use and with which I am intimately familiar. Once I had familiarized myself with the sound in my system, I moved theMinotaur to a second system owned by a local audiophile where with a small number of friends, I proceeded to compare the Minotaur to a number of other well respected AC cables. We had determined in previous listening sessions in a third system that the location where a power cord seemed to have the greatest effect was running from the wall, namely via an Oyaide R-1 duplex to the Bybee Curl AC line filter which provided power to the system’s source components. This was clearly not the case in the second system which used a Weizhi in place of the Bybee. (See also Ed Momkus’ Weizhi PRS-6 Review. –Ed.) While the cord from the wall to the Weizhi made an audible difference, the cord running from the Weizhi to the component made a much larger difference. Each amp was plugged separately into its own dedicated line, again using R-1’s. We had a sufficient number of cords to one-by-one change out of most of the cords in the system. As discussed below this allowed us to determine where the substitution made the most difference, as well as the additive effect of adding additional cables to the system. We also had a number of other cords which we could insert for comparison. Although this methodology yielded consistent results, it did have several major weaknesses: 1) the more complex the geometry of the conductor, the more it seemed to benefit from being plugged in for an extended period prior to listening tests; and 2) the substitution of the power cord, since it fed a device powering all the front-end components, required that the system be powered down, at least momentarily, each time a different power cord was introduced. As time passed, we did get more adept at making quick switches. 6. Jerry Garcia/David Grisman/Tony Piece, The Pizza Tapes. While there are various ways to present the data from the listening tests, it seemed most instructive to talk about each cut separately focusing on how a conductor when inserted into the system altered the sound of that recording. In earlier sessions, additional cords had been compared; however, given the clear superiority of the Stage III and Jorma Prime and SE over the other cords, it seemed pointless to prolong the comparisons by adding the previously eliminated cords. At some point in the listening, I find it helpful to install the review item in friends’ systems. If nothing else, this provides a check against my own experiences. The initial comments below resulted from extended listening sessions in a system built around Acoustat Spectra 6600 speakers driven by EMM Labs separates and FM Acoustics power amps. Most of the cabling except for power cords was Jorma Prime. One key aspect of this system was that it employed Curl Bybee AC Line Filters on the low level electronics. For the most part, the power cords were Tweek Geek Bybee Super Effect. Initially, we installed a pair of Minotaurs to power the FM Acoustics amps, leaving an SE on the preamp. Starting with Al Dimeola’s Consequence of Chaos, cut 6 “Sanctuary,” the system did a nice job of recreating the stage left to right with good detail and tight, well controlled bass and nice mid range. Switching to a Vortex Prime on the preamp resulted in an audible increase in loudness, perhaps 1-2 dB. Again, the placement of instruments on the stage from left to right was locked in, but now there was a better sense of depth. Bass was significantly more prominent. The different drums hard left were better articulated making it easier to identify the type of drum being struck. Detail was excellent, but not noticeably better than with the SE. The Minotaur’s presentation on the amps was very even handed not favoring one instrument over the others. silicon molds for insulators Switching back to the SE on the preamp but leaving the Minotaur on the amps, we then listened to Jorma Karkonen’s Blue Country Heart, cut number 1. The tonality of Karkonen’s guitar was spot on. Fiddle and voice were very realistic with good detail and no spot lighting. The soundstage was well defined left to right, but, on this material, somewhat forward and somewhat lacking in space around the instruments, and two-dimensional. Substitution of the Vortex Prime on the preamp significantly improved both definition and depth with images taking on body and dimensionality. We next replaced the Minotaurs on the amps with Vortex Primes. The Minotaurs were clearly superior on the amps. They were much more three-dimensional, better detailed and had clearly superior bass. In comparison to the Minotaur, the sound of the Vortex Prime could be characterized as somewhat duller, with bass that was less controlled and noticeably lower in level. The Vortex Prime did a nice job of recreating the soundstage; however, the Minotaur in comparison was holographic with better leading edge and better decay of struck instruments. The SE was very nice in the dead mid-range, but otherwise suffered in comparison to both the Minotaur and the Vortex Prime. During the listening sessions at my friend’s home, the speakers were large planar electrostats. In this particular listening environment, the image which they created had a tendency to shift as one moved his head. This was very pronounced with all cords auditioned except the Minotaur and the Zyklop, which created a relatively stable soundstage. I suspect that this may be related to the phase accuracy of these two cords. At this point, we decided to stop listening to the power cords and just focus on the music using the Vortex Prime on low level equipment and the Minotaurs on the amps. Of the remaining music played, the two JVC XRCD’s, the Kelly Blue and Soultrain were particularly nice. While comparative listening sessions like the one described above are extremely helpful in identifying gross differences between cables, there is no real substitute for long term listening in your own system. As a general rule, the more complex the geometry of a conductor and the more exotic the dialectric, the more the cable will benefit from being continuously played in a system without being moved. If anything, repeated plugging and unplugging of a cable over a short period disrupts the formation of the dielectric and plays havoc with its sound. While the Zyklop was the best cable in the test group, certainly the one with the best balance of strengths and weaknesses, the Minotaur was a very close second and in some instances better on some source components. The Zyklop was clearly better when more current was necessary such as on power amps or power strips, but the Minotaur could sound as good or better on equipment with very low current draw. In comparison to the Jorma Prime, either could sound somewhat less rich in the midbass and lower midrange. Both had a cleaner, more extended top-end than the Jorma and were more balanced and cleaner from top to bottom. Over the course of an hour of play, the tonal balance of both the Zyklop and the Minotaur in the midbass and lower midrange filled in but never quite matched that of the Jorma. Over time, the ASP cables retained the extension at the top, and control and extension in the low bass that the Jorma lacked. 6. Defalla, Three Cornered Hat (FIM). While long term listening did not really change my evaluation it did clarify my earlier impressions. This cable really has the ability to startle the listening “jump factor”. Intelligibility of voices was excellent. The sound of stringed instruments was never strident. Although it did a great job of preserving the leading edge, that was never at the expense of truncating the decay or tail. It seemed to add solidity to images. If I were to use a one-word descriptor for the sound, it would be “balanced”. My reference SACD/CD player continues to be the excellent EMM Labs XDS1. During the review period, I substituted the Minotaur for a Jorma Prime with spectacular results. Treble and midrange were smoother and better defined, while bass increased in depth and articulation and the unit became quieter and more dimensional. All this while removing artifacts and noise that subtly masked the fine detail in music and images. While I am a lawyer by trade and not an engineer, many of my friends have very solid engineering backgrounds and are quite skeptical about the effects of wire and power cords. Some of that skepticism has rubbed off on me; consequently, I much prefer that a manufacturer explain his products in scientific terms without resorting to voodoo or pseudoscience. This is one of the things that I like about Stage III. But more importantly, their cables deliver on their promises. 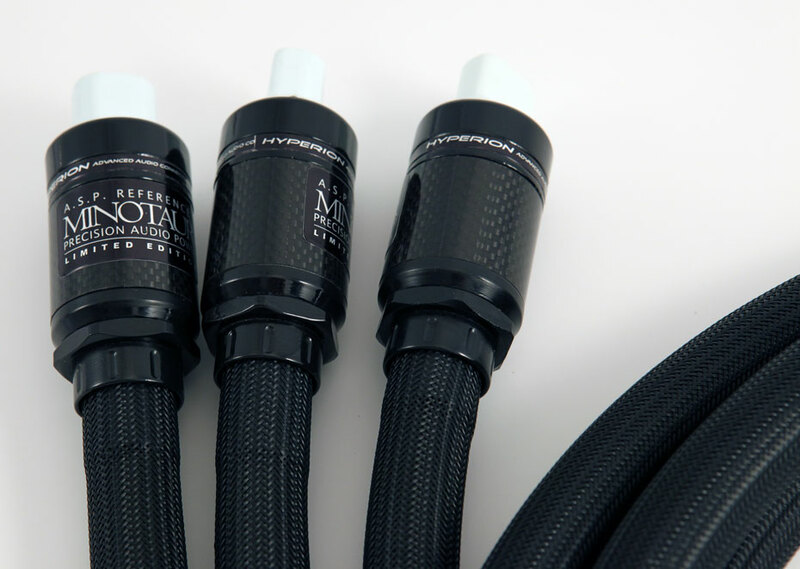 Zyklop and the less-expensive Minotaur power cables will enhance almost every performance aspect of your system. Increased video contrast and sharpness will make images practically holographic. This design represents the current limit for linear, silent and unrestricted power delivery for the best audio and video components. In comparison to almost all other power cords that I have auditioned, the Zyklop and Minotaur power cords represent significant gains in frequency extension, stage depth, retrieval of low-level detail, transparency, recreation of soundstage, noise, natural tonality and dynamics. In addition, they have an uncanny ability to balance the instruments in a mix so that all receive attention but none predominates at the expense of the others. Perhaps most importantly, it has the ability to draw you into the music and communicate the excitement of a live performance. As you may have noted, this cable is not cheap, but a single strategically placed power cord can have a major impact on the sound of an entire system, particularly when that one cord is providing power to a multi-plug distribution center into which other components can be plugged. This is particularly true when the other cords are also from the Stage III line-up.